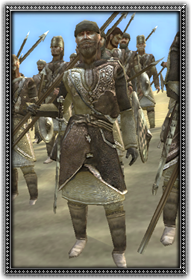 These men have been forcibly drafted into the service of their masters to do the dirty work in sieges, perform garrison duties, or just to make their armies more impressive in size. Given a long spear and shield, but little training or armour, they are only of use in defensive roles or as cannon fodder. When their fear of the enemy surpasses their fear of their masters, they will flee.